Ever since the fall of 1977, Evans' regular working trio has undergone a number of personnel changes. 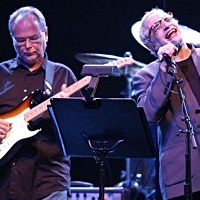 He seems satisfied finally with his current group, which includes bassist Marc Johnson and drummer Joe La Barbera. 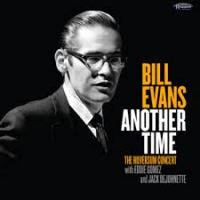 Evans found it particularly difficult to replace bassist Eddie Gomez, his companion of 11 years. "It was a long, happy, and beautiful relationship," he recalls. "With all that we had learned together, I must say it was rather traumatic for me to even contemplate having a new bassist. I think all in all it ended up being a constructive move. Change is healthy, and it forces you to look at things a little differently, to reach a little deeper. 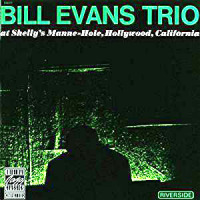 "My drummer, Eliot Zigmund, left almost the same time as Eddie, and Philly Joe Jones came with the trio then. We worked with various bass players for a while until Marc Johnson came along. 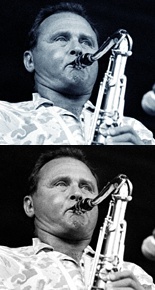 Marc, who had been working with Woody Herman, had been calling me, and we were trying to get together, but he was always on the road with Woody. So finally he got a night off while they were in West Virginia, and we were at the Village Vanguard. He called me and said he'd fly up. I said. 'If you want to go through all that juts to sit on, it's up to you.' So, he came, and very shortly after we started playing the first tune, I realized there was something very special in him. I got extremely positive feelings." Does Johnson's playing remind him of Gomez? "Not really." he answers. "I'm sure that he's learned some things from Eddie. But to me their sound and articulation are quite different. And they really think differently. Marc really reminds I me more of Scott LaFaro." 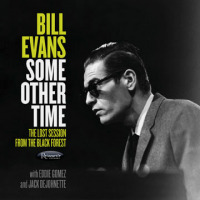 That's no small comment coming from Evans, for it was the work of LaFaro in particular that sparked Evans' trio of the early '60s to great heights. 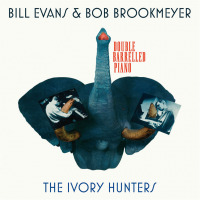 And Evans still seems to regard his work with LaFaro and drummer Paul Motian as one of the high points of his career. "That was just a marvelous, magical thing," he recalls. "It was a case of three talents arriving early in their careers, meeting with a desire for a common goal, and laying everything else aside to try to achieve it. We tried to give ourselves room to break with some of the traditional things, but only when it made sensenot just for its own sake. By the time we had done the Village Vanguard dates, a lot of that conception had been realized. That was the last time we played together before Scott was killed." "That group was the springboard that all my subsequent trios came off of. But the trios that followed looked to that conception as a point of departure. I became more of a leader, and mine was the main projected voice. Of course, maybe it was just as well, because I think Chuck Israels' strong point was his time playing and his musicality; he wasn't the virtuoso that Scott was. When Eddie Gomez came along in 1966, he provided a chance to revamp. We did a lot of beautiful things with Eddie, but I think with him I was less inclined to take that fresh approach. I had gotten into a more predictable feeling. I always tried to play creatively and spontaneously, but conceptually it was pretty static. That's where I hope we'll start to change more. "I have the feeling that this current trio is more similar to the one with Scott and Paul than any I've had before. I don't know exactly what it is except that they inspire me to go for that fresh approach, and when I do, they go right with whatever's happening. Maybe it's the mixture of the personalities and interests. I don't want to put down any of the trios that I've had because they're all special in their own way. But I feel like the perspective for this trio offers some potential that the others might not have had. "Also, I feel that I am coming to a greater expressive period personallya new creative feeling. Maybe that has more to do with it than anything. Some of the other trios were more than ready to go to various different directions, but I think I was less able to carry them there then. The last year or so has been the beginning of some kind of new period for me, though. I can hear it in the records I've made, and we're working and performing more, too. I have this feeling that it could be a really good time for me during the next 10 years if I can hang on that long." 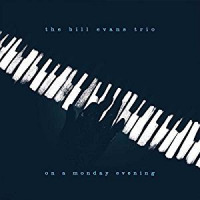 Growing up in central Jersey, Evans studied classical piano at a very early age and by the time he was 12 considered himself quite an accomplished boogie-woogie player. He was introduced to jazz soon after that.